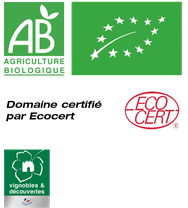 KALIAN produces about 4000 bottles of Bergerac Rouge per year. KALIAN’s Bergerac Rouge is a blend of Cabernet Franc (50%), Cabernet Sauvignon (25%) and Merlot (25%). Like the Monbazillac, in crafting our Bergerac Rouge, we do everything we can to grant it a personality that reflects the terroir. The quality starts in the vineyard: bud removal, suckering, leaf pulling and sometimes dropping fruits. We harvest by hand when the grapes are perfectly ripe. They are then brought to the winery in small lugs in order to avoid damaging the clusters, thus preserving the integrity of the berries. Sorting occurs over and over again: in the field during harvest, then in the cellar in the lugs and finally just before the berries are slightly crushed (see picture of a manual crusher). Processing: the slightly-crushed berries are transferred to small vessels by gravity (by hand). 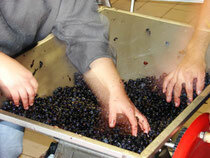 This transfer by gravity is ideal: there is no damage to the berries which are treated with the utmost respect. Then we cold soak the fruit at 12-15°C for between 2 and 3 days. This allows us to obtain a more fruity and fine wine thanks to a slow extraction of phenolic (anthocyanins) and aromatic compounds. After this light maceration we start alcoholic fermentation. Temperature is maintained between 24 and 27°C. Throughout the fermentation we manually punch-down and/or pump-over on a daily basis ensuring optimal contact of the cap and the juice. When there is no more sugar and after tasting, we start a post-fermentation maceration. At this point the vessels are kept at a constant temperature (about 28°C) undisturbed for whatever time is deemed necessary to finish the wine (gaining in substance, structure and roundness). Regular tasting determines when to stop this maceration and press the must.